The Federal Reserve’s Federal Open Market Committee will meet on October 27 and 28, and one of the discussion topics will be whether to raise the federal funds interest rate, the short-term rate banks pay on overnight loans. This rate has been close to zero since the beginning of the Great Recession to promote economic expansion. When the rate is higher, the economy slows, because the rates for things like car loans and mortgages will generally rise as well. The Fed would want to raise interest rates if it wants to slow the economy to prevent inflation, but the cost is that in a slower economy fewer people have jobs and workers have less bargaining power to demand higher wages. Low inflation and an incomplete recovery are strong arguments for keeping the interest rate near zero in the hope of supporting more rapid growth. With stronger growth we will see more and better jobs. In a tighter labor market, more workers will enter the labor force, involuntary part-time employment will shift to full-time employment, and workers will have the opportunity to move to higher-paying jobs. Another reason the Fed should keep interest rates low is that the benefits of lower unemployment will disproportionately go to groups that are marginalized and disadvantaged. One way to look at this is to look at how drops in white unemployment affect black unemployment. Historically, the overall unemployment rate for blacks has been twice the unemployment rate for whites. The unemployment rate for black teens has been six times the white unemployment rate. This means that for every one percentage point drop in the white unemployment rate, the black unemployment rate drops two percentage points, and the black teen unemployment rate drops six percentage points. This rule of thumb provides a remarkably good fit for recent years. From January 2000 to September 2015, the black unemployment rate was on average 2.0 times the white unemployment rate, and the black teen unemployment rate was 6.2 times the white unemployment rate. With lower unemployment, the black-white unemployment gap shrinks. If the white unemployment is allowed to fall one percentage point by 2016, the projected black unemployment rate falls from 9.5 percent to 7.3. The black-white gap falls from 4.6 percentage points to 3.6. For black teens, the unemployment rate falls to 21.9 percent from 28.4 percent. The black teen-white gap is then 18.2 percentage points versus 23.2 without lower unemployment. If white unemployment fell two percentage points by 2017, the effect is even more profound. The black unemployment rate would be 5.2 percent and the black teen unemployment rate would be 15.6 percent. The black-white gap would be down to 2.6 percentage points, and the black teen-white gap would be 13.0 percentage points. In September 2015, if the black unemployment rate were 5.2 percent and the black teen unemployment rate were 15.6 percent, there would be about 800,000 more employed workers, including more than 100,000 additional black teens with jobs. 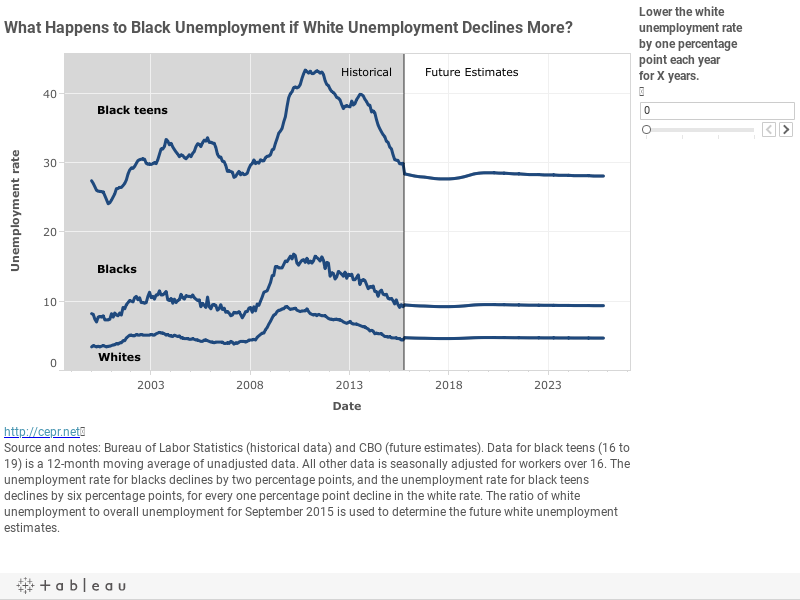 This exercise shows the importance of keeping interest rates low, and how the resulting reduction in unemployment would greatly benefit black workers. With low inflation and the recovery still incomplete, low interest rates still make sense.